You're invited to lunch. Join us for a brainstorm with John Bracken, Director of Media Innovation with The Knight Foundation. John is currently facilitating a $5 million challenge to harness data to advance community health. Madison is a leader in health innovation, so this event is designed to identify collaborations. Got a data set? Got an idea? Got a business? Let's put in a strong set of collaborative applications from Madison! Brainstorming begins at 11am and a free lunch will be provided. John S. Bracken oversees the Knight News Challenge, Knight’s prototype fund, its journalism and technology investments. Bracken has over 10 years experience as a philanthropic investor in digital media, media policy, innovation and global internet freedom, having previously worked at the Ford Foundation and the MacArthur Foundation. Bracken is a frequent presenter at media and technology conferences and serves as an adviser to 1871, a co-working resource for digital startups in Chicago. A 2009 fellow of Leadership Greater Chicago, Bracken has a masters degree from the Annenberg School for Communication at the University of Pennsylvania and a BA from Pitzer College in Claremont, CA. He writes @jsb, johnbracken.net and at the Knight Foundation blog. Attendance is free and limited to 50. Apply for a spot now. Do you already have ideas for a challenge application? 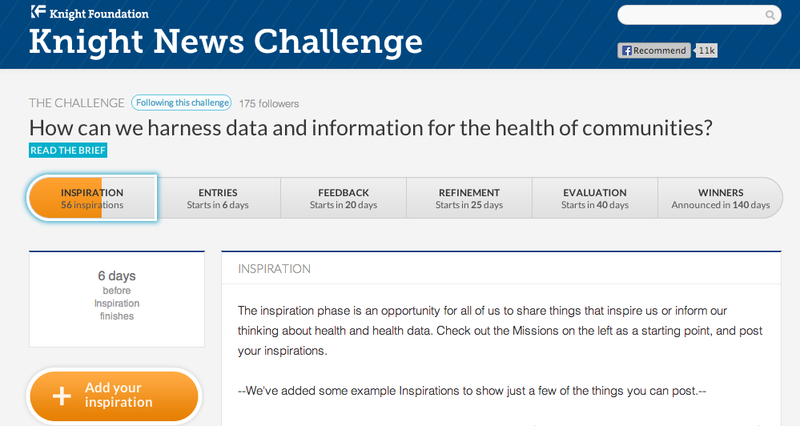 Thanks for applying to join the Health Data Challenge! Visit newschallenge.com and bring your ideas to the event. Healthcare experts, entrepreneurs, data nerds, public health professionals, researchers, government officials, and innovators. You're invited to a talk by John Bracken followed by collaborative brainstorm. If all goes well, you'll meet some awesome people and we'll submit a bunch of applications to the challenge. September 11, 2013 for lunch from 11am to 1pm.